Test Function and Display Altitude Encoder Output in the Aircraft or on the Bench! 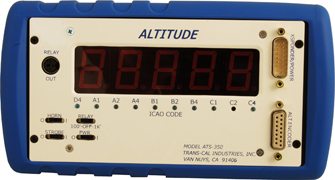 The ATS-350 allows the avionics technician to functionally test and display the output of Altitude Reporting Equipment, which conform to the ICAO Standard for SSR Pressure Altitude Transmission. In accordance with the U.S. National Standards for I.F.F. Mark X (SIF)/Air Traffic Control Radar Beacon System (SIF/ATCRBS). Devices providing such data typically conform to FAA TSO-C88a and or EASA ETSO-C88a. The ATS-350 utilizes an advanced RISC microprocessor to decode and display the output of these devices in both numeric and binary forms, with an input altitude data range of -1100 to +62,700 feet. An audible signal is also generated at 100-foot or 1000-foot increments. The ATS-350 also incorporates a relay triggered at either the 100-foot or 1000-foot altitude code transistions. This relay can be used to trigger test equipment or annunciators for the test technician. This output trigger point is controlled via a front panel slide switch labeled RELAY. Both normally open (NO) and normally closed (NC) relay contacts are provided via a front panel mini-DIN connector. The relay contacts are rated to 5A at 30Vdc.